You'll discover tucked-away gems like Karen Blixen Coffee Garden and Cottages and Nature & Wildlife Tours. Explore the numerous day-trip ideas around Nairobi: The Forest (in Kimende Town), Mount Longonot (in Maai Mahiu) and Machakos (Maanzoni Sanctuary & Machakos People's Park). 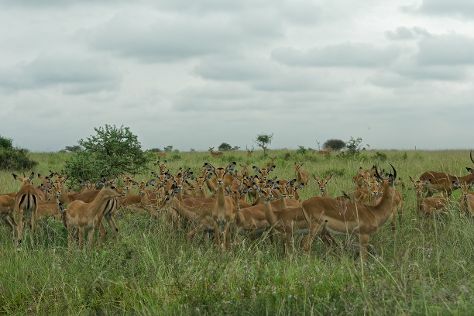 Spend the 2nd (Sat) exploring nature at Nairobi National Park. Spend the 3rd (Tue) exploring nature at Dickson Mutaiti. Next up on the itinerary: take an exotic tour of a safari tour, grab your bike and head to Karura Forest, admire the landmark architecture of African Heritage House, and get outside with Outdoor Activities. To see reviews, ratings, maps, and tourist information, refer to the Nairobi trip itinerary builder website . London, UK to Nairobi is an approximately 13-hour combination of flight and bus. You can also fly. The time zone changes from Greenwich Mean Time (GMT) to Eastern African Time (EAT), which is usually a 3 hour difference. Plan for much warmer temperatures traveling from London in November, with highs in Nairobi at 28°C and lows at 19°C. Finish your sightseeing early on the 3rd (Tue) to allow enough time to travel to Cape Town. Step off the beaten path and head to West Coast National Park and Franschhoek Pass. Venture out of the city with trips to Hermanus (Kwaaiwater, Originals Gallery, & more), Stellenbosch (Wine Tours & Tastings, Stellenbosch University Botanical Garden, & more) and Betty's Bay (Stony Point Penguin Colony, Harold Porter National Botanical Gardens, & more). The adventure continues: take some stellar pictures from Cape of Good Hope, kick back and relax at Bloubergstrand Beach, stroll through Boulders Beach, and make a trip to Bay Harbour Market. To see reviews, traveler tips, photos, and more tourist information, read our Cape Town trip planner . Getting from Nairobi to Cape Town by flight takes about 9.5 hours. Other options: drive; or do a combination of car and train. Due to the time zone difference, you'll gain 1 hour traveling from Nairobi to Cape Town. In December in Cape Town, expect temperatures between 30°C during the day and 18°C at night. You will have some time to spend on the 30th (Mon) before leaving for home.